Over the next few months, we will be discussing marketing tools for your point of sale receipt paper rolls. These tools are a follow up to our original post in January. A receipt is the perfect place for you to further promote your company. At a minimum, your website (if you have one) and logo should be included on every receipt. From there, the next step is to add a call to action. This is simply a reason for the customer to shop at your establishment again or visit your website. 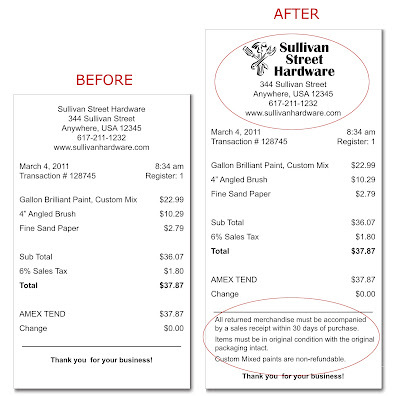 Receipt marketing is a simple way for you to stand out from the competition and build company recognition. Most point of sale printers have the capability to upload logos and images for printing on the paper roll receipt. These printers include credit card terminals like VeriFone, Ingenico or Hypercom; cash registers like Casio, Sharp or Royal and standalone printers like Epson, Star Micronics, CognitiveTPG, Bixolon or Citizen. A logo at the top of a receipt draws more attention to the company name and helps build brand brand identity. A return policy at the bottom can help avoid any potential issues with your customers. Now that you have your first pointer on how you can market to your customers, you want to be sure that the customer sees the message. It is vital that you train your staff to point out the message by circling or highlighting it with a marker in order to increase read rates. Do you do any receipt marketing? If you do, how did it help your business? We'd love to hear about your real life examples!